Here’s what’s up in the world of TV for Wednesday, May 11. All times are Eastern. 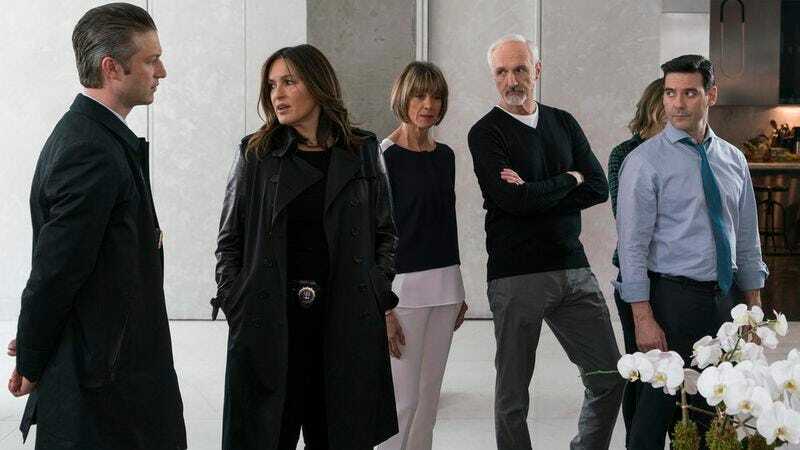 Law & Order: Special Victims Unit (NBC, 9 p.m.): The episode is titled “Assaulting Reality,” so you know exactly what this is about: “The producers of a reality dating series make Benson and the SVU part of the show when they investigate a contestant’s claim that she was raped.” That’s definitely going from point A to point 12, and that’s exactly the type of thing that gets you 17 seasons of Law & Order: SVU and counting. As are great casting choices, as this episode’s guest star list includes Larisa Oleynik, Michael Gross, Wendie Malick, and Mather Zickel. That’s a pretty solid list, SVU. Heartbeat (NBC, 8 p.m.): It’s “Match Game” on Heartbeat, and you know what that means! Sadly, it means no game-show episode this early in the series run, so… You probably don’t actually know what that means. Here we go then: “When Alex’s father needs a new kidney, an unlikely donor emerges and family secrets threaten to destroy the close relationship between father and daughter.” Now, imagine that but with a version of Match Game designed for organ donations. You’re welcome, NBC—can’t wait to see that on Saturday Night Live. The Americans (FX, 10 p.m.): The Americans is a great show, and that’s the biggest no-brainer in this edition of What’s On Tonight—but boy is its latest episode synopsis severely lacking. “The Day After premieres, making the stakes—and terrible consequences—of the Cold War plain. Even with that in mind, will Elizabeth be able to complete the painful process of the ‘Patty’ operation?” There’s just something about that first sentence that rubs your friendly neighborhood What’s On Tonight contributor the wrong way, though the whole thing feels like it could lead to a longer episode synopsis that ultimately ends with an “At the end of the day…” At least Erik Adams now realizes how not to end his review of the episode. Chelsea (Netflix, midnight): Who’s got another new program on Netflix, premiering tonight? Chelsea do, that’s who! (Yes, that was a very specific Psych quote.) This Chelsea is Chelsea Handler, of course, and after doing stuff/things, she’s back in the talk-show world. Only, you know, on Netflix. Criminal Minds: Beyond Borders (CBS, 9/10 p.m.): We’re sure at least one of you is hyped for a new episode of Criminal Minds: Beyond Borders, at a “special time” of 9 p.m. And yes, we’re talking about you, Matthew Stechel. (No one is reading this—it’s fine!) Then, there’s the regular episode of Criminal Minds: Beyond Borders at 10 p.m., the one we actually want to talk about. In “The Ballad Of Nick And Nat,” “when American victims are found in different locations throughout Cuba, the International Response Team heads to the island nation to search for possible spree killers.” That checks out, right? An episode of television titled “The Ballad Of Nick And Nat” should naturally be about “spree killers” in Cuba. That’s what Nick And Norah’s Infinite Playlist was about, right? Underground (WGN America, 10 p.m.): Underground ends its critically-acclaimed first season with “The White Whale.” In the episode, “everyone must pay for their sins when the day of reckoning arrives.” This may be Underground’s first rodeo, but it clearly knows what it’s doing. Psych, “Neil Simon’s Lover’s Retreat” (Netflix): We’ve already linked you to that episode review, so you might as well watch the episode too. Plus, frequent Chelsea Lately panelist Arden Myrin actually played the role of Chelsea in this episode of Psych, so… synergy?